We present a facile strategy for highly sensitive and selective determination of copper(II) ions and vitamin C (ascorbic acid, AA) using new amino-terminated nitrogen-doped carbon quantum dots (CQDs) synthesized from melamine as the carbon and nitrogen source by the hydrothermal method. The CQDs have superior optical features, including a pH-sensitive photoinduced electron transfer process. The CQDs form a complex with Cu2+ ions, leading to the development of naked-eye, colorimetric, and fluorometric determination. AA reduces the Cu2+ ions to Cu+ ions, which cannot form the complex. Thus the absorbance and fluorescence of the CQDs are recovered by addition of AA because of dissociation of the complex into Cu+ and CQD. 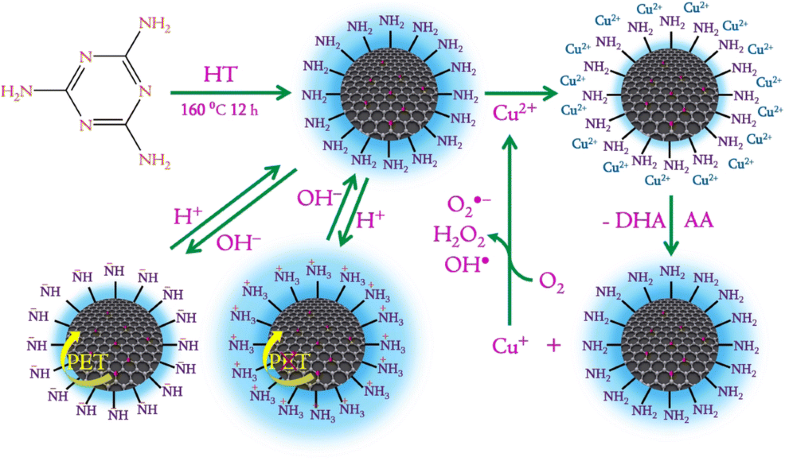 The in situ generation of reactive oxygen species when AA is added to Cu–CQD complexes in the presence of dissolved oxygen leads to the sensitive determination of AA, proposed on CQDs for the first time. The in situ generation of reactive oxygen species was confirmed by a fluorescence method using a hydroxyl radical indicator (i.e., coumarin). 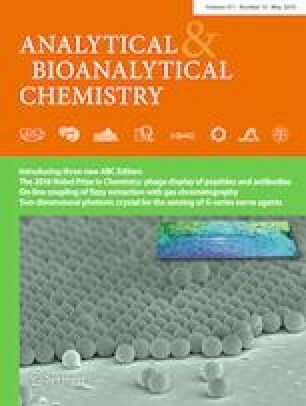 This novel “turn-off/turn-on” sensing approach using amine-functionalized CQDs is potentially applicable to determining the concentration of Cu2+ ions and AA in the areas of materials chemistry, nanobiomedicine, nanobiotechnology, and bioengineering because of its high sensitivity, high selectivity, low cost, simple naked-eye readout, and good linearity. The online version of this article ( https://doi.org/10.1007/s00216-019-01710-8) contains supplementary material, which is available to authorized users. GK thanks joint CSIR-UGC, India, for the award of a senior research fellowship. The study was approved by the ethics committee of the CSIR Central Electrochemical Research Institute health center and was performed in accordance with ethical standards. Informed consent was obtained from all individual participants included in the study. Pollock N, Fowler G, Twyman LJ, McArthur SL. Synthesis and characterization of immobilized PAMAM dendrons. Chem Commun. 2007:2482. https://doi.org/10.1039/b701550j.